I don’t know if there’s a Japanese dish like this, but I love mixing and matching vegetables with the staple Mapo recipe. One of my favorite Chinese/Japanese dish is Mapo tofu. I also love variations of it such as Mapo Nasu and particularly this one, Mapo Beans. Cooking Mapo is rather easy as long as you have the right ingredients. 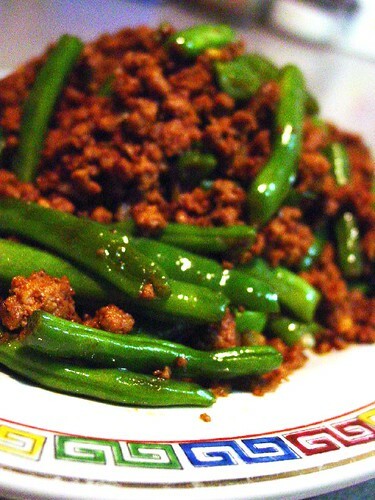 There are two crucial ingredients for Mapo and that is Chili Bean Paste (Tou Ban Jan) and Chili Garlic sauce (the chinese kind, not the sweet chili sauce in the market). These two ingredients are easily available in groceries and won’t cost an arm and a leg to get. For those who are scared that these rot easily, rest assured that they’re good to store for a year or so in your fridge and you’ll be addicted to mapo that you’ll be shocked that you’re out of Tou Ban Jan and Chili Garlic sauce. 1. On a really really really hot wok, place the half kilo of pork and cook it until it’s light colored and has released its own oil. This way you can save on the greasiness. 2. When the pork is lightly brown, add the onion, and then the garlic. Let the flavors infuse a bit on the pork and then toss in the green beans. 3. Add the soy sauce, the chili bean paste and the chili garlic paste. Just keep on stir frying until you notice that your oil is red and the pork already has a nice brown colored. (It’s going to be a fast cook, like 30 minutes, including prep time. lolz.). Serve hot and over hot steaming rice. YUM!!!! I’m sure after this, you’ll start mixing other things with the Mapo! *fufufu* Cooking Mapo Beans is similar to Mapo Nasu. Mapo Tofu is a different story altogether. lol. But its close. ^_~ Anything with pork and chili beans and chilli paste tastes great! That’s if you’re a big fan of anything spicy. I know that in Singapore, they also use this chilli garlic in almost anything. lol. Ahh~ I miss that place.